Tandem® Plus Capsules provide 106 mg of elemental iron that replete both the ferritin (stored) and transferrin (circulating) iron levels. Tandem Plus also contains Folic Acid and selected Vitamins for your complete, well rounded therapy. Each Tandem® Plus capsule is equivalent to about 106 mg of elemental iron. Dual Action Technology for increased toleration, absorption and repletion of both the ferritin (stored) and transferrin (circulating) iron levels. 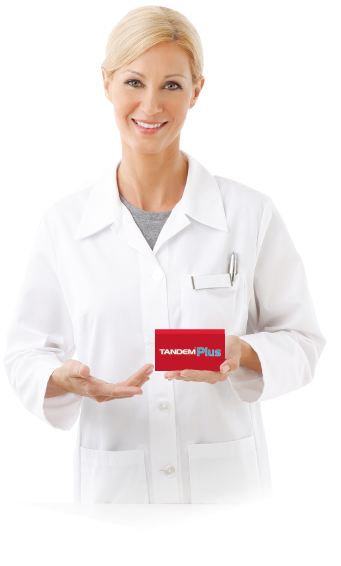 Tandem® Plus contains 1 mg of folic acid to treat certain types of anemia (not enough red blood cells). Vitamin C is a powerful enhancer of nonheme iron absorption. The enhancement of iron absorption from vegetable meals is directly proportional to the quantity of Vitamin C present. Odorless, tasteless and easy to swallow: Take one Tandem® Plus capsule a day between meals or as prescribed by physician. Like many other multi vitamins, Tandem® Plus does not contain any calcium for optimal iron absorption.